A Fine Stout Love and other Stories is a compilation of five carefully edited short stories written in such an intimate and beautiful way that they will inspire our hearts and prompt a smile in our faces every time we turn a page. In the beginning of the book we are presented with a poem about Pride and Prejudice and how the author thought about creating new stories based on Jane Austen’s characters that I found absolutely delightful and original! It is a small detail but I loved it! In each story we are immediately submersed into the characters world and that allows us to enjoy every single page as if it were the last page of our favorite novel. All the stories occur during a specific timing of Pride and Prejudice original plot, so readers will need to read Jane Austen’s book first to fully engage into the short stories. However, the author always mentions in which specific timing the short story is taking place, so those familiar with P&P will easily immerse into them. Even though I loved the book in general, these stories are very diferente and enticed in me different reactions, so I’ve written a few lines about each one of them. In the first short story of the book, Elizabeth starts finding some notes from a secret admirer while leaving her house and on her way to Meryton, that make her flattered but extremely curious. During her walk, and besides the notes, she also finds Mr. Whickam and discovers how he truly is. Finally, upon reaching her destination, the church’s graveyard, she encounters another person, this time; it’s Fitzwilliam Darcy who has been receiving mysterious notes himself. They discover their notes complement each other and when compiled they form a love letter Mr. Darcy wrote to Elizabeth in his journal. The love letter is one of the most beautiful love letters I have ever read! I will not publish it here because it will spoil the sequence of the mystery notes, but believe me when I say it is just as perfect as Wentworth’s letter to Anne! I was fascinated by this letter; it was so beautiful, so romantic, so perfect! I absolutely loved this short story, and was only sad not to discover earlier in the story who placed the notes that brought our couple together. This short story is told from two different perspectives: first Elizabeth’s and then Darcy’s. The story will focus on a brief encounter between Darcy and Elizabeth but the writing captivates us and we are immersed immediately into their intimate meeting. The story itself is very simple but captivating. Elizabeth writes a poem thinking of Darcy and after Lydia steels it to tease her sister, the paper ends up flying into the man himself. Can you imagine Mr. Darcy reading a love poem destined for him? Or Elizabeth’s embarrassment at having him read it? When she hears the rumors about Darcy’s engagement to Elizabeth, Lady Catherine literally drops dead (funny right?). Elizabeth has a very special gift that is different when it comes to Darcy. This story is very different from canon and it was a little too esoteric for me. I am not a big fan of these kind of premises and that is why this was my least favorite story in the book, however, I consider that readers with a more open mind to these subjects will like it considering it is very romantic. What if Mr. Darcy wrote a poem to Elizabeth that was accidentally discovered by another sister and ended up being read by the entire family before reaching the final recipient? Which consequences would a love poem written by a passionate man have on Mary Bennet? Could it make her change her perspective on love and marriage? What if Mrs. Bennet thought this poem had been written by Mr. Bennet for her? Could it give another color to their marriage? In this story we are presented with 2 poems Mr. Darcy writes to Elizabeth and the first one made me swoon! I think Renne Beya should write poetry because in the 3 stories of the book where she wrote poems I was completely captivated. The poems are such romantic additions to these stories! They are very, very, very good and created a warmth in me that I usually only feel when reading my favorite poets. Summing up, this book is a fantastic book, perfect for those moments when we need Darcy and Elizabeth but don’t have much time to read a novel, or for when we are eager to go straight to the romance. The stories can be read one at a time and will satisfy our need for immediate romance while giving us a sense that we’ve been with these characters for a long time. The stories are very well written, captivating and we are immediately drawn into them making the book a pleasant and easy read. And the poetry, oh, the poetry! I’ve mentioned it before, but it is so utterly romantic! Even Elizabeth would agree that these poems would be the food of love! The author did an amazing job with this compilation and I’m looking forward to read What Love May Come, the second volume of short stories Renée Beya will release later this year. I’ve told her as much and she was kind enough to share with me a little of her new project. I loved it, and today I’m very happy to share with all of you the blurb , the cover and the very first excerpt of What Love May Come and Other Stories! Join Elizabeth Bennet and Fitzwilliam Darcy as they discover the hope of second chances and the triumph of joy over sorrow in this novella-length story collection. – Three years after the death of his wife, Darcy visits Longbourn to reminisce. Will he find laughter and maybe even love once more? – While extended family celebrates, Elizabeth is privately mourning a miscarriage. 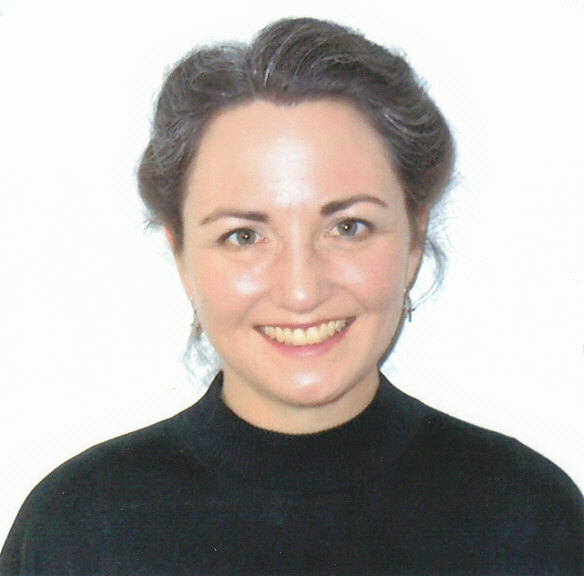 Will attending a Christmas service bring solace to her grief? – A shocking secret threatens Darcy and Elizabeth’s reunion twenty-five years after their Hunsford debacle. Can they surmount their pasts to rekindle their love? – After reliving sublime moments in his marriage, Darcy faces the prospect of life without Elizabeth. How will he meet his future? These poignant period shorts will moisten the eye and stir the heart, but like fine dark chocolate, their rich taste will linger long after they are finished. 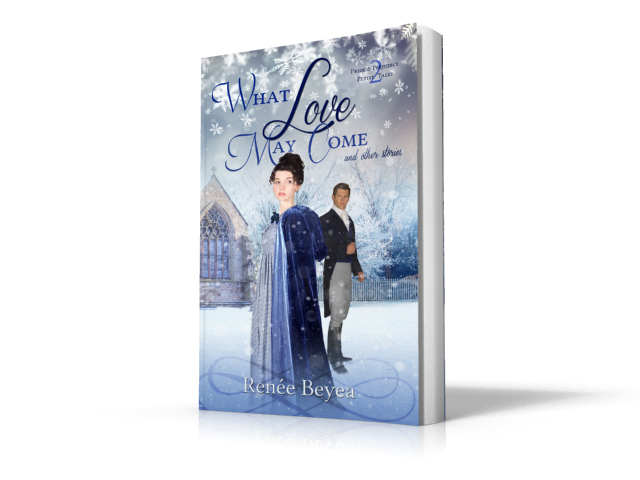 Thank you, Rita, for the lovely review, for your generous hospitality in inviting me to visit From Pemberley to Milton once more, and for the opportunity to share with your readers the first sneak peek from What Love May Come and Other Stories (available this winter–*hopefully* before Christmas)! Although this second volume of Pride and Prejudice Petite Tales is more poignant than whimsical, like its predecessor, this collection stands alone and contains five short sequels and variations centered on Darcy and Elizabeth–complete with happy endings (just in case anyone’s anxious about the blurb, LOL). To whet the appetite, here’s a vignette set early in their marriage and taken from a sequel story titled “A Strange Mercy.” Enjoy! Darcy swept his palm over the silken counterpane and stopped before the little side table that held several treasured articles, among them a framed charcoal sketch. Sketch was an overstatement; scrawl was more apt and in his hand no less. He had chided Elizabeth for keeping it, but the sight pleased him now. He traced a finger along their initials and the misshapen heart, as he recalled that long afternoon spent in Pemberley’s library. “Hmm?” He lifted his attention from the volume in his hand. His wife balanced three steps up a sliding ladder, her eyes traveling over the book spines as rapidly as her fingers. He resisted telling her to remain on the floor and have a care for their unborn child. “What do you wish to know?” He closed his book and set it on a nearby table. She was teasing him, but with that same sweetness that initially won his heart. He was undeniably pleased and warmth radiated through his chest. “Come,” he said and raised her to stand as he likewise gained his feet. He led her across the room to a writing desk where he withdrew a full sheet of foolscap along with one of his sister’s forgotten charcoals and began sketching his family tree. He might have referenced any number of documents, but he worked from memory, giving accounts as he went. Elizabeth sat beside him in rapt attention, asking questions, sometimes bubbling with amusement or silent with shock. The butler interrupted to query if they wished dinner served in the library. They did. On they pressed until by the genial glow of lamplight and the crackling of the fire, he finally added her initials with a flourish and joined her name to his. Renée Beyea would like to share her short stories with my readers by offering a giveaway of 2 ebooks. The giveaway is open internationally and the winners may choose either A Fine Stout Love (available now) or What Love May Come (available when released). Let us know what you thought about these 2 books and which one you would like to win, if you have any questions, go ahead and ask! All comments posted until the 14th of September will be eligible for the giveaway. I’m breathless after reading these excerpts. Must. Have. More. Thank you for offering the giveaway, and please enter me for A Fine Stout Love. If both were available now it would be a difficult decision, but my patience won’t hold out until “when released.” LOL! Yay, love that you’re another poetry fan! As Rita said, the poems and love letter are definitely the most romantic part of the collection (although there’s sweet romance aplenty in each story). Good luck on the giveaway! A Fine Stout Love was a sweet little collection. I liked the variety in it. That first story with the trail of letters was my favorite. 🙂 But neat! I didn’t realize another collection was coming out. I definitely want to read that one and that’s what I’d pick if I won. Enjoyed your review that reminded me of the stories and appreciated the teaser into the new one. I am really intrigued by What Love May Come. I like the blurb about them meeting over twenty years since Hunsford. I would like to win What Love May Come. Patricia, I’m so relieved the blurb intrigues you! To be honest, that’s what I’ve been most worried about with this second collection–that readers will be leery of potentially bittersweet stories, even if they’re assured all comes right in the end. Best of luck! Thank you, Kirsten! Best wishes with the giveaway! I’m glad you enjoyed A Fine Stout Love as much as I did! I can’t wait for the next collection! 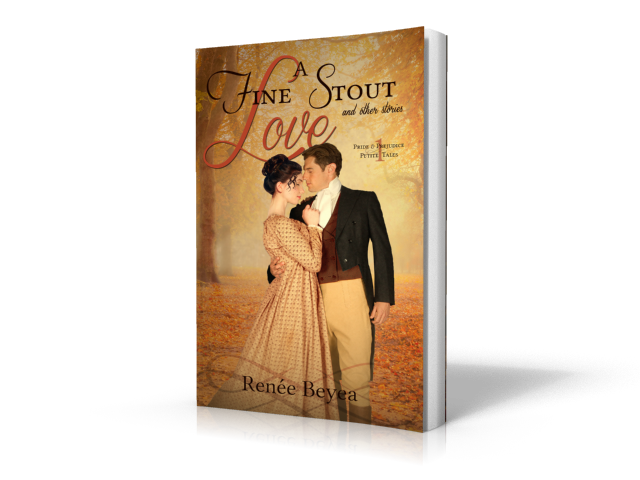 Well, I tried very hard to win a copy, when “A Fine Stout Love” was on its blog tour, and unfortunately did not get one. So I will try again this time. If I am chosen, I’d prefer “What Love May Come”. Thanks for the offer. Renee, I’ve enjoyed the works of yours that I’ve read (like “Darcy-san”) so I know that these will be just as enjoyable. Better luck this time, Ginna! The odds are certainly better, since it’s one post and not an entire tour. 🙂 I’m thrilled you read and enjoyed “Darcy-san.” It’s on the list to be completely overhauled and eventually published (which also means you may have already read the short stories when they were available online–though they’ve been professionally edited since then). they both sound wonderful, I’m open to either read. Oh, wow! It sounds wonderful. The first is on my TBR. They both sound like amazing books. Thanks for the giveaway and the short, sweet reviews. You’re welcome for the giveaway, and thanks for commenting! The books’ themes are very different, so it will depend on whether you want to start with a bit of whimsy or something a touch more serious. I loved, Loved, LOVED A Fine Stout Love and, judging by the excerpt, What Love May Come looks like another great collection of short stories. It’ll definitely be one I’ll watch for if I don’t get picked. Thank you for the giveaway opportunity! Your enthusiasm makes my day, Debbie! Forgive me for the belated expression of gratitude, but please know how very much I appreciate your thoughtful review on the first volume. I’ll be curious to hear what you think about volume 2.